Radon is a cancer-causing radioactive gas. You can’t see it, smell it, or taste it, but the U.S. Surgeon General has warned radon exposure is the #1 cause of lung cancer in non-smokers. Radon is a radioactive gas that comes from the natural breakdown of uranium in soil, rock, and water. Due to the “stack effect” it is sucked into your house through cracks and other openings in the foundation. Because of the amount of time we spend in our homes, exposure to radon is of a critical concern. 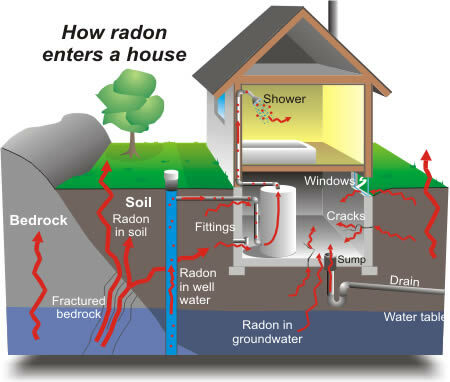 Why should I worry about Radon in my house? Dangerous levels of indoor radon have been found in every state in houses with or without basements – old and new. The Environmental Protection Agency recommends ALL homebuyers have a radon test performed prior to purchase. Accurate testing is the only way to determine if your family is at risk from radon exposure. If your test comes back above 4.0 pci/L the EPA recommends your home be mitigated. How can Radon cost me? Radon testing has become routine in real estate transactions. Increasingly, knowledgeable buyers are asking for a radon inspection and remediation clause in the sales contract. Most corporate relocation services require that the seller assume all responsibility for radon testing and remediation. High radon levels are easily and inexpensively fixed by a NRPP or state qualified contractor, called a radon mitigator. Because every buyer will one day be a seller, conscientious Realtors recognize that radon testing is in everyone’s best interest. Furthermore, the U.S. EPA estimates 21,000 Americans die of radon-induced lung cancer every year. The American Association of Radon Scientists and Technologists (AARST) estimate 10 million homes and 38 million Americans are at risk from dangerous radon exposure. Who should test the house I want to buy? Because it is such an important test, always insist on a trained licensed radon technician. Our comprehensive radon measurement service produces a reliable test result you and your family can truly depend on. Why is using a continuous monitor so important? Advanced Radon Testing utilizes the most precise, sensitive and accurate radon monitors available and our comprehensive support service insures our clients receive the most reliable radon test reports. Each of our instruments is regularly maintained and calibrated by our staff of engineers and technicians. Low-sensitivity continuous monitors are purchased and used by many home inspectors because they are cheap. Their extremely low detector efficiency is highly susceptible to statistical errors and false fluctuations in the hourly readings. They have no ability to record environmental data to ensure closed-house conditions or track unusual weather changes that can cause false highs. There is no regulation or assurance the monitor is regularly maintained and calibrated. Don’t trust such an important test to anything less than a CRM – Continuous Radon Monitor. What should I expect during a radon test? Prior to testing, closed house conditions are required for a minimum of 12 hours. Our licensed radon technician will need to set your radon test in the lowest, livable level of your home. Closed house conditions need to be maintained for the 48 hours the radon test is in progress. The licensed radon technician will pick up your radon test at the end of the 48 hours. Advanced Radon Testing is built upon accuracy, precision and integrity. We strive to educate the public and protect families from the dangers of radon one test at a time.